Join us on Wednesday, November 2 at 12:15pm in the ModLab (Fine Arts 215) for another Well Played session. 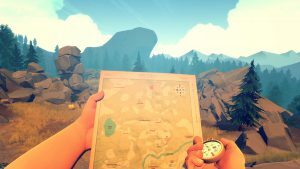 DSC Intern Joe Dupon will lead a discussion of Firewatch, game in which the player follows the Story of Henry, a fire lookout in Shoshone National Forest. The game has been praised for its beautifully rendered scenery as well as its deft storytelling. As always, those attending will be encouraged to play portions of the game and to discuss gameplay, artwork, sound, storytelling, and more. This event is free and open to the public.